On Halloween this year, you are likely to see some four-legged friends on your doorstep next to the children. That’s right, more and more people are taking their dogs trick-or-treating with them. So, why not have a separate bowl of dog biscuits at the door next to the bowl of candy for the children? 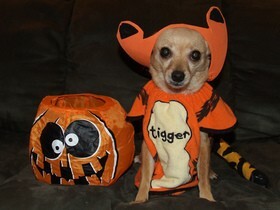 It’s a fun way to do something special for the dogs that visit your home this Halloween. Sure, offering store-bought dog treats is a nice touch. But why not do something extra special by making some homemade Halloween dog biscuits instead? Your house will definitely be the talk of the neighborhood if you give those out to all of your four-legged visitors! Here are the 10 homemade dog treat recipes that you can modify to make your own Halloween dog treats. Above photo: They look so tasty, but smell so stinky. Dogs love ’em! Here’s the recipe for Stinky Fish Treats for dogs. If you’re planning far enough in advance, then you might be interested in buying some Halloween dog treats rather than making them. These classy dog treats would be an extra special reward for your own dog and the dogs that you might cross paths with in the days surrounding Halloween. Whether you give four-legged trick-or-treaters ‘regular’ dog biscuits this Halloween or special homemade ones, you’ll need to decide in advance how you will give them to the dogs. Give the dog biscuit directly to the dog owner to give to their dog now. This is the easiest option, since no extra planning is needed. 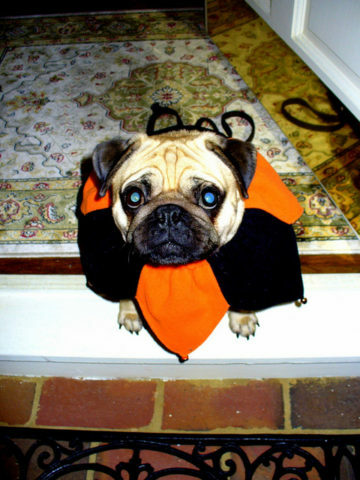 Wrap a dog biscuit in a small Halloween decorated bag and hand it to the dog owner to give to the dog later. If you made the dog treats yourself, consider including the actual recipe. You’ll make the dog owner’s day! Place a Halloween dog treat in a see-thru snack-size baggie. That way, it’s obvious to the dog owner (and the children) that this treat is intended for dogs. With the right markers or paints, you could make small Halloween decorations right on the plastic baggie for a simple, fun touch. By the way, does your dog always bark at the doorbell? Halloween is a great time for dog doorbell training!